4.2 out of 5 based on 48 bloggers and 19 commenters. 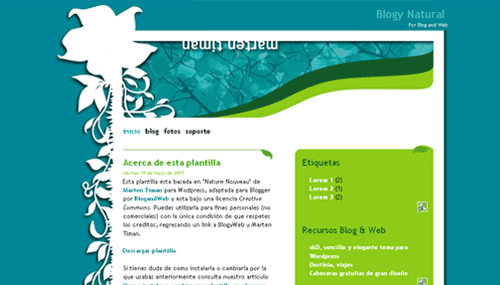 Natural is a free blogger template adapted from WordPress with 2 columns, right sidebar, girly looking, floral motifs and vectorial elements. Excellent template for blogs about to write a diary, fashion or nature. On blogger, go to Edit HTML and upload from there. Go to Choose File, find the file on your computer, then hit Upload. The upsidedown ‘martin timan’ ruins it though. Can you remove it? I used the EN version, but I still have some words in Spanish: Archivo del blog. I understand the language (mostly) but a lot of my viewers might not. Can it be changed? To change the header that says “Marten Timan”, you just have to edit the header5.gif, upload to your site and add the new link in the “#header-img” style. Just wondering if I wanted to change the ‘martin timan’ thing, how do I change JUST those words, and not the rest of the image? Is there a way to replace the ‘martin timan’ with my blog name or my name instead? I’m getting an error code when I load it up in the edit html section. What am I missing? Hola, coloque este template en mi blog pero quiero quitar lo que dice Martin Timan, hice lo que dice de quitar header5.gif pero no pasa nada… quiero dejar esa barra solo quitar el nombre para colocar el mio. Gracias! Hi, i upload my image in Flickr cause i want to change were it says “martin timan” when i paste the link in “#header-img” it goes white and it dosen’t appear my image… HELP!!!! hie sorry, how can i expand the space for the blog posts?! but I figured it out, and learned how to use the template for my blog! It looks awesome, so thanks again! The only problem I seem to have is that my friends keep telling me that they can’t comment on blog posts..
Hi there, it’s been almost a decade since I launched this theme and it’s nice to see it’s still being used :-) I will release an updated version later this year which will be responsive and more dynamic then this old version. Check my website now and then (it’s in dutch) or follow my account on Codecanyon.com (user ‘atypisch’). Thnx!